This overland adventure takes us from the bright lights and glittering temples of Bangkok to the palm-fringed and white sand beaches of Krabi. Along the way we learn about the Bridge over the River Kwai, visit cave temples, camp on a remote beach, spend time getting to know locals and explore one of the oldest rainforests in the world. Using a variety of transport and staying in a selection of simple accommodation, it's an adventurous trip that combines some of Thailand's best highlights with remote hideaways, away from the main tourist trail. Arrive in Bangkok and check-in at the hotel. After meeting the rest of our group in the late afternoon, we embark onto Bangkok's impressive metro system to travel to our evening's destination - Bangkok's bustling Chinatown. The city's frenetic energy is encapsulated within this one kilometre strip of gold traders, street-side restaurants, market stalls, Chinese temples, and of course bright neon lights. We make our way through the melee of stalls where our Explore Leader will explain the history of this area, providing some context for the colourful and exotic scenes in front of us. For those that are hungry, there is a huge array of tasty street food to try, and for those feeling brave, there is the delicacy of this area- deep-fried insects! Today has been left free for you to explore Bangkok. There are a number of optional excursions available, enabling you to choose how you discover this fascinating city. One stand-out highlight of Bangkok is the Grand Palace, the city's gleaming and glittering centrepiece. Constructed in 1782, it was the home of Thai royalty for over 150 years, as well as housing the Royal Court and administrative seat of government. Its intricate carved statues, art work and gold-gilded architecture is some of the best in the country, and the complex also houses the Temple of the Emerald Buddha, one of the most sacred temples in the country. Next door to the palace is Wat Pho, otherwise known as the 'Temple of Reclining Buddha'. The iconic temple houses a huge 46 metre long golden Buddha and is symbolic of Buddhism in Thailand. Another popular option is to explore Bangkok's 'Klongs' - a narrow network of waterways navigated by long-tail boats and water taxis, offering a different way of seeing the capital. Other options include cycling through Bangkok's 'Green Lung' in Sri Nakhon Park, a morning excursion to the Damnoen Saduak Floating Market, and a full day trip to visit the temples of the ancient capital of Ayutthaya. We make an early start today, heading to Kanchanaburi located 128 kilometres west of Bangkok. We visit the world-famous Bridge over the River Kwai and Allied War Cemetery and ride on the train along the infamous Death Railway, before continuing onto the Hellfire Pass. The building of the bridge and railway is one of the most infamous episodes of the Second World War. The Japanese built the railway to link Siam and Burma (Myanmar) using Prisoners of War between June 1942 and October 1943. We spend time learning about the gruesome history here before boarding a train for a ride along the so-called 'Death Railway', that offers wonderful scenery, but more importantly, context to the information we have taken in. Today has been left free in Kanchanaburi, where there are a number of different activities available. You could go back and visit the Bridge over the River Kwai, walking across the bridge and along Hellfire Pass, or you could choose to float gently down the Kwai Noi River on a bamboo-raft. The nearby Erawan Waterfalls are well worth seeing, a cascading complex of waterfalls and emerald-green rock pools. It is also possible to arrange a cookery class whilst here. This morning we leave Kanchanaburi behind and head south towards Khao Sam Roi Yort. Following a break for lunch we set off on a walk through the mangroves using a series of boardwalks, and here it is possible see several species of rare birds, such as the Oriental Hobby and Spoon-Billed Sandpiper, which use these freshwater marshes as an important breeding area. From the mangroves we continue onto Sam Phraya Beach, our base for the night. We pitch our tents on the fringes of the white sand beach, with the rest of the afternoon free to spend relaxing in the tropical surroundings. Dinner tonight will be taken in a local beach-side restaurant. Tents are of the 2 person dome style with sleeping mats and bags provided. There is a shower and toilet block with western toilets, and some participation will be required when putting up the tents. There is a cafe on the beach for dinner and where snacks can be purchased, but please note that alcohol is prohibited from being consumed on this beach. After our beach-side breakfast we drive a short distance to Laem Sala and set off on foot to explore the spectacular Phraya Nakhon Cave, with its atmospheric pagoda built within. There is a short but steep ascent up a staircase, but the sights waiting at the top makes the climb worthwhile. After some time spent exploring the cave we then move onto Koh Phithak, where we leave behind the mainland and take a long-tail boat over the short kilometre crossing to the island, before getting settled into our homestay accommodation and meeting the community that will be hosting us over the coming 2 nights. The accommodation here is a mix of twin-share and communal rooms, with some people staying in the homes of locals, whereas some people may be in the community hall. There is access to toilets and showers in a central area, and all meals are provided. Today has been left free to either relax and soak up the tranquil atmosphere, or to explore the island. There is a short circular walk of around 1-2 kilometres around the island, and there is also the option to take a boat trip out to snorkel the surrounding coral reefs. In the evening you may like to join the local fisherman on a squid fishing quest, where we learn the interesting techniques of this old trade, and if we get lucky our catch can be cooked onboard the boat for us to enjoy - ocean to plate in a matter of minutes. After saying goodbye to our hosts we continue our journey south this morning, heading for our riverside jungle lodge in Khao Sok National Park. Covering an area of some 65,000 sq km, the park is one of the oldest and most bio-diverse jungles in South East Asia, boasting a lush rainforest that is older than those of either the Amazon or Central Africa. This evening we take an exciting night walk with our local guide along jungle trails, learning about the flora and fauna of the park. The park is home to a rich diversity of wildlife including elephant, tiger and Malaysian sun bear and with some 180 species of birds it is a haven for keen birdwatchers and novices alike, although of course wildlife viewings can never be guaranteed. Today has been left free for you to explore the park at your own pace. There is the option to hire canoes and take them on the river. Alternatively if a more relaxing day is preferable then it is possible to swim in the river near the lodge, or simply relax and enjoy the idyllic jungle surroundings with the noises of the rainforest all around, and the sight of monkeys descending from the surrounding canopy to drink at the water's edge. This morning we leave our jungle surroundings and head for the coast, the beautiful white sand beaches of Krabi our final destination. The journey will take approximately three hours, and after checking into our beach-side hotel, the rest of the afternoon is free to spend at leisure. Today is free to relax on the beach, or you may choose to take one of a number of optional excursions. There is the option to take a speedboat to the idyllic island of Koh Phi Phi that includes swimming and snorkelling in Maya Bay (famous from the film 'The Beach), discovering Viking Cave and visiting the monkeys living on the aptly named Monkey Island. Other possibilities include a kayaking trip through the mangrove forest of Ao Thanlane, you could visit Krabi's natural hot springs and the emerald lagoon, or take a traditional long-tail boat through the towering limestone cliffs of Phang Nga Bay and visit the famous 'James Bond Island'. The trip ends in Krabi after breakfast. Please note prices stated are a guide and may vary up or down depending on the number of participants. This is an adventurous trip that explores not just the beaches of southern Thailand, but the lesser-visited mainland too. 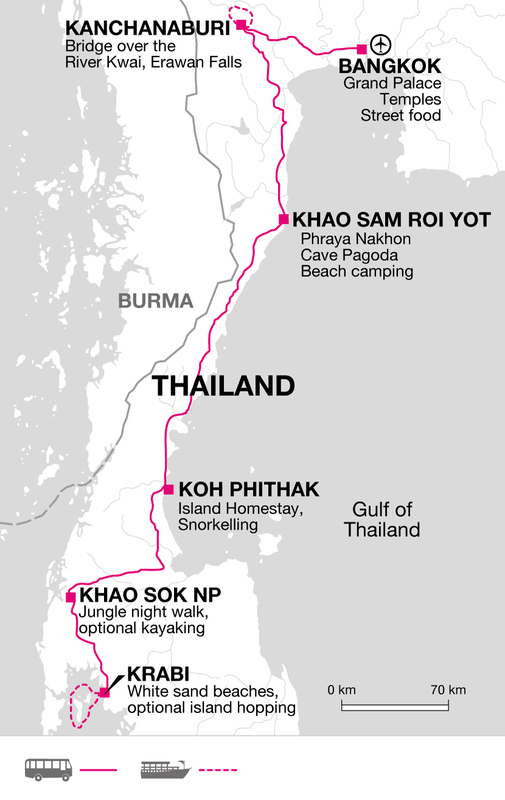 Accommodation is a mixture of simple hotels, guesthouses, homestays and camping, and there is plenty of free time built in, allowing you the flexibility to choose what you want to see and how you want to explore this region - whether on foot, by kayak, by train, by long-tail boat, by tuk tuk or by bike! The trip ends in Krabi, allowing you to easily extend your time on the beach should you wish.